A system that works smarter. Our Platinum ZV Variable Speed Air Conditioner comes with AccuComfort™ technology that allows the system to consistently adjust to run at a more efficient speed to maintain your personal level of comfort. 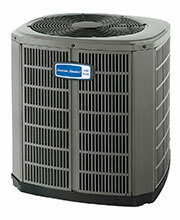 Plus, with a 20 SEER rating, it’s one of the most efficient air conditioners on the market. Our AccuComfort variable speed line of air conditioners work smarter to maximize home comfort at a lower operating cost.